The Clique Men’s Fairfax is made from 100% polyester to withstand rigorous wear and retain shape. 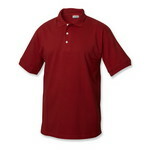 Embroider your company’s logo on the soft and easy to maintain Pique Polo. Features Three-button placket and Moisture-wicking fabric to keep you dry all day long. The Clique Men's Lincoln is a classic Polo T-Shirt, which is an absolute must-have in one’s wardrobe. The Clique Men’s Malmo Snag Proof Zip Polo is made from 100% polyester with a refreshing new design. A great polo to wear on the gym or in the office. Designed with a self collar and a three-button placket for a professional look.